Given the omnipresent atmosphere of political confrontation and the worldwide armament, the International Peace Bureau (IPB) organizes the World Congress on global disarmament and military spending. The event takes place from September 30th until October 2nd 2016 at the Technical University of Berlin. About 1000 guests from all over the world are expected to participate at the Congress. The IPB World Congress is supported by the International Trade Union Confederation (ITUC), UNI Global Union, the Stockholm International Peace Research Institute (SIPRI), by international religious organisations (of different persuasions), organisations from the environmental and development policy sector as well as by the three big political foundations in Germany: Heinrich Böll, Friedrich Ebert and Rosa Luxemburg. You will find an overview of our supporters at: https://www.ipb2016.berlin/partners/. What is the International Peace Bureau? 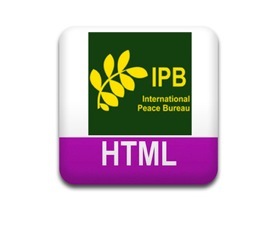 Founded in 1891/92, the International Peace Bureau (IPB, www.ipb.org) is the oldest existing international peace network. It counts more than 300 member organizations in over 70 countries and was awarded the Nobel Peace Prize in 1910. Over the course of time, 13 prominent IPB leaders were also awarded the Nobel Peace Prize. The IPB devotes itself to the vision of a world without war. The main focus of its work is “Disarmament for Sustainable Development”. Within this programme, it mainly strives for the re-allocation of governments’ military spending. For 6 years, the IPB has been the coordinator of the Global Campaign on Military Spending (including the Global Days of Action on Military Spending, GDAMS. Since the 1980s, the IPB has promoted the worldwide campaign for nuclear disarmament, aiming at the abolition of all nuclear weapons. What is the aim of the Congress? According to official SIPRI records, the combined military budgets of the world’s governments totalled $1,7 billion in 2015. In the same year, 900 million people suffered from hunger. Every day, 10.000 children die of curable diseases. Social inequalities are increasing. In the face of these growing social challenges and the desperately needed financial resources to mitigate and adapt to climate change, money must under no circumstances be wasted by investing in the military sector. Global disarmament must be put on the international agenda. Therefore, the Congress wants to help build support for a peace agenda, bringing about a peaceful and fair distribution of the world’s resources. The Congress will centre on questions of global transformation. How can we encourage fundamental and desperately needed changes? How can we foster cooperation and dialogue in order to reach common security goals? Transformation to peace is among the biggest challenges of the 21st century. 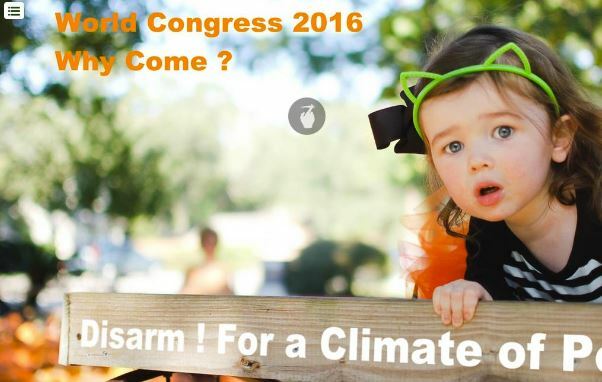 Thus, the Congress is set up as international peace gathering with a clear message: “no to war and confrontation”. The people’s active participation, promoting a new international democracy, is inseparably linked with the successful development of the worldwide peace process. Humans are led to support wars, often seduced by lies and false concepts of ‘the enemy’. Nevertheless, people all over the world stand up for freedom and peace, often by organising great public events. One big aim of the Congress is to make a major contribution to the international peace movement. A range of ideas will be discussed and a “Plan of Action for Peace” will be presented. Attempts will be made to bring together theoretical considerations and real transformation strategies. Moreover, the Congress shall be an impulse for the initiation of more peace actions all around the world. The organisers confront the world of war with a clear vision of a world of peace. Several prominent guests joined the Congress. Among the speakers in the plenaries, in panel discussions and working groups will be, among others, the Nobel Peace Prize laureates Tawakkol Karman from Yemen and Mikhail Gorbachev (via video), the founder of the “Right Livelihood Award” Jakob von Uexküll, the laureates of the “Right Livelihood Award” Vandana Shiva and Alyn Ware, prominent economists like James Galbraith, Noam Chomsky (via video) and Samir Amin, the Co-President of the Club of Rome Ernst Ulrich von Weizsäcker, the secretary generals of ITUC and UNI Global Union Sharan Burrow and Philip Jennings, the former Director General of UNESCO Federico Mayor Zaragoza, the former Defence Minister of Ecuador and current Permanent Representative of her country to the United Nations in Geneva María Fernanda Espinosa Garcés, the director general of the United Nations office in Geneva Michael Møller, and the chairman of ver.di Frank Bsirske. The Congress will be opened by the President of the Technical University of Berlin, Christian Thomsen, and by the Senator of finance in Berlin, Matthias Kollatz. You will find the provisional, already quite extensive, program at http://www.ipb2016.berlin/program/program-structure/. The latest news will also be published on Facebook: www.facebook.com/IPBcongress2016. A diverse program of cultural, informational and other side-events will accompany the Congress. Moreover, there will be an independent “Youth Gathering”. More information will be published at www.ipb2016.berlin. Equally, you can contact Reiner Braun, Co-President of the IPB (reiner.braun@ipb.berlin; phone: +49 172 231 7475).